Long Ji is one of the world's most beautiful rice terraces. 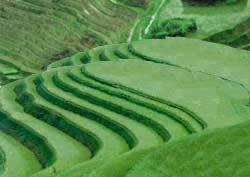 It is also one of the world's largest rice terraces, measuring 66 square kilometers (26 square miles). The Long Ji Rice terraces were begun in earnest during the Yuan Dynasty (1271-1368) and were virtually completed by 1700. The term Long Ji translates as Dragon's Back, the popular English name for the terraces. The time you go will affect what you see. The paddies are lush green with growing rice stalks in the summer. After the fall harvest, paddies are exposed bare soil (no greenery or water). They are later filled with water, forming reflecting pools. They remain that way until the first rice shoots appear in the spring.